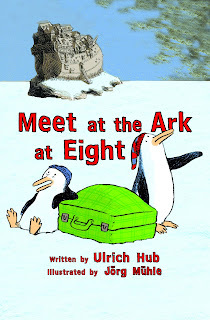 Publisher's description: "Two squabbling penguins who smuggle their little friend aboard Noah's ark under the watchful eyes of an officious, overworked dove, find many answers to their questions about God during their journey." My first thought when I saw that was, "uh....no." Who would ever read that? But those penguins look awfully adorable and I read a couple other blurbs from the publisher and became interested. So, I requested a copy from LibraryThing Early Reviewers. To sum up, I really enjoyed this book but I can't think of a kid at the public library that I would hand it to. Although it's loosely framed around the story of Noah's Ark, Noah only appears briefly at the end and most of the story is dialogue between the three penguins and then the dove. In the end, the penguins and dove pair off and I think that's really going to bother some people, even more than the religious questions. People are weird. The original description is a little misleading, since there's no final answer to the penguins' questions about God. It's not an overtly religious book for any particular denomination, but it raises topics like why does God allow suffering, how do you know God exists, and does God make mistakes? I don't think many kids will pick up on one of the main themes - that all these different creatures are defining God the way they see him - without some adult guidance. It's also quite funny, in an almost adult way, with little digs and sly jokes here and there. Verdict: This would be a really interesting book to read together with an 8-12 year old, or younger, to spark discussions about God and religion. However, I don't think it's going to be of general interest in the public library. I will probably donate my copy to the local Catholic school, as I think this is something they'd find interesting to discuss with the kids. ISBN: 9780802854100; Published September 2012 by Eerdmans; Review copy provided by publisher through LibraryThing Early Reviewers. This picture book hits so many perfect points it's hard to know where to begin. Sierra loves to play soccer and is thrilled that's she's been accepted for a team that plays in a real field, with coaches and "shiny girls." But she's sad that her aunt, whom she lives with, can never come to see her play. When her aunt is finally able to come watch her game, it gets rained out. Then Sierra has an idea; have a game at the old field near her home. Finally, the people she knows and loves can see her play in her own neighborhood. Lauren Castillo's illustrations are beautifully restrained, filling in the emotion that lies behind the text and gently illustrating both the similarities and differences of the girls. What I love about this story is it has so many levels and it's pitch-perfect. There's Sierra's poetic enjoyment of soccer, her determination to share that love with her family, and her creative thinking outside the box. Sierra has a very different life than the other girls on the team, but she isn't trying to change her family or herself; she wants to involve her own world in the sport she loves. She's a valued player on the team, but she knows she's an outsider and she's ok with that. There isn't a moment where she is suddenly accepted into the tight friendship of the other girls and that's one of the most skillfully handled aspects of this plot. Sierra's life may seem underprivileged to the other girls and she certainly has challenges they don't have to face, but she has friends and family in her own neighborhood and doesn't feel a need to transform herself into the girls she plays with. So many stories about kids who are poor or have broken families seem to show them as coming from an empty or worthless background, with the focus on changing them to fit into a new, better life. 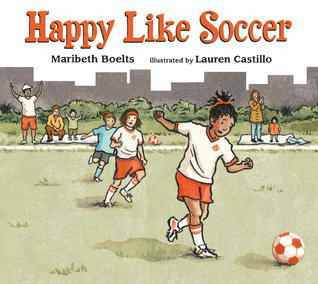 In this book, all the girls have friends, family, and a love of soccer in common and even if they're not best friends, they work together so everyone can celebrate what they love. Verdict: Even kids who don't play sports will love this story with its rich language, exciting sports moments, and creative thinking from a smart, determined girl. This was one of the nonfiction titles I added my first few months at work, and I mainly purchased it because I saw the popularity of the Ancient Egypt and Ancient Greece titles in the series. I finally got around to reading it, as I'm looking over the history section in preparation for some weeding/replacing next year. 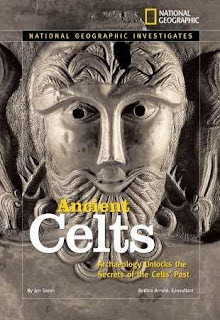 I was interested to discover that this isn't so much a history of Celts, but an exploration of that history through archaeology. The author blends the history of the Celts in Europe into the archaeological discoveries that provided the information. So we learn not only about the bog bodies, but about how their discovery continually changes the way people think about history and the process of inspecting, dissecting, and preserving them. There are plenty of photographs, some fun references to popular culture, and a nicely broken up layout with bold paragraph headlines, captions, interviews, and more. Verdict: This is a great series for middle grade kids interested in history. While the Egyptian, Greek, and Roman titles are more popular, this is a compelling read and kids who have tried the others will want to pick this one up as well. Nothing too exciting this week, just planning, publicity, and more of the same. As of Wednesday about half our circulation staff is out sick with one thing or another. Some of them are soldiering on (people with overdues are gonna get a nasty shock when they hear L's rasping croak over the phone!) and some of them dropped by the library with their grandson to check out books and found themselves behind the desk checking in van delivery! I let my summer aide go with great reluctance and pizza all around (NO, I didn't fire her! I only get her for the summer). She and my regular aide created awesome windows! We also acquired a new library pet, Monty the praying mantis. Then on Tuesday someone brought in a BIGGER Monty and we traded up. Guy delivering pizza, waiting patiently at my desk. Me, racing up, "Sorry for keeping you, the grasshoppers got loose!" Guy, looking around library, "uh...ok?" Me, "It's a long story." My one "program" thing was visiting a local group, the VIP Aktion Club. They are sponsored by Kiwanis Club and they put together fundraisers and then distribute the money to local groups that serve children. Many of the members are developmentally disabled. They do an amazing job raising money, Kiwanis just supervises and they run the whole club themselves, treasurer, secretary, etc. In the past, they've given me money to get our aprons (which we use practically every week!) other supplies, and legos. I basically talked about the three main programs I do (or am planning to do) Preschool Interactive, We Explore, and after school clubs and showed them how we incorporate early literacy and other developmental stages into our programming. Everyone enjoyed reading Don't let the pigeon ride the bus and I talked a little about adult programs and resources as well. This book has just that little bit extra that takes it past the average "animal friends have ups and downs" easy reader. In the first chapter, Monkey and Elephant decide to find some shade, away from the hot sun. But Monkey is too slow and Elephant is too fast. When they find a puddle, they both splash differently. Can they compromise? As they continue their walk into the second chapter, they find more things they don't agree on and one thing they do; singing! Finally, they start seeing shapes in the third chapter. Could they be trees? After a scary adventure, they finally find shade and decide their friendship is just right. Bernstein's illustrations are crisp, digital swirls of color. Blue elephant and purple monkey are subtly associated - both have curls in their ears. Monkey has the curl motif repeated in her tail, while Elephant's tail matches Monkey's splayed feet. It's the little surprises in the story that move it past the classic, and now somewhat overdone, Frog and Toad model. Fun vocabulary words sprinkle the text; scampered, galumphed, bumpity, swishing, and more. Monkey and Elephant's differences aren't just personality-wise, they're also physical and species; Monkey is small, quick, and sometimes vulnerable, Elephant is big, slow, and sometimes clumsy. Together, they make a perfect team. 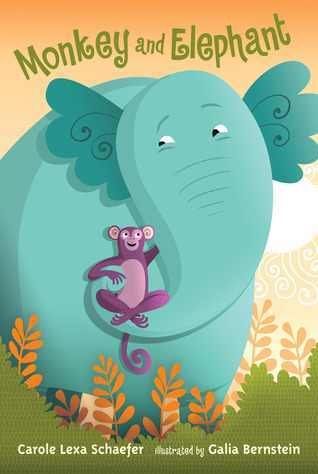 Verdict: This is a bright new addition to the classic easy reader genre and I look forward to more Monkey and Elephant stories. I picked this up thinking it was a picture book with, from the rather poor image I saw online, very realistic illustrations. 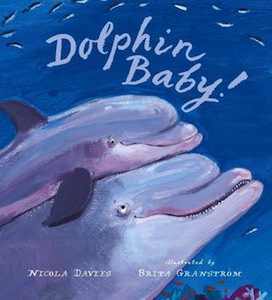 It turned out to be a slightly anthropomorphized story of a baby dolphin from birth to catching his first fish, with swirling, colorful acrylic paintings. I fell in love with it anyhow. Davies' language is simple and perfect for reading aloud. It's a little long but would work well with older preschoolers. There are additional facts about dolphins and their world included in captions among the illustrations and in the author's note at the back of the book. There's also a simple index. What really won me over to this book was Brita Granstrom's stunningly beautiful illustrations. Great swathes of color, small humorous details, shades from dark to light, all illuminate the sometimes gentle, sometimes terrible, but always beautiful world of the baby dolphin. Verdict: Lovely to look at and fun to read aloud, this would make an excellent addition to your picture book or nonfiction collection. I am pleased to be hosting Nonfiction Monday on August 20. Leave a link to your post in the comments and I will add them to the Nonfiction Monday round-up throughout the day. For all you nonfiction fans, now is the time to apply to be a Cybils judge! The nonfiction panels are great places to be, especially the nonfiction picture book panel (hint hint). The process to apply is simple, but make sure you read ALL the instructions! And now, on to the round-up of amazing nonfiction posts throughout the Kidlitosphere! 500's: Animals! Space! Math! Science! Several poetry anthologies, including Requiem by Paul Janeczko (part of the What are you reading? meme) at Gathering Books. Bookends Blog is reviewing Temple Grandin by Sy Montgomery, with Common Core Standard connections appended. Russell Freedman's newest biography, Abraham Lincoln and Frederick Douglass: The Story Behind an American Friendship is being reviewed over at Challenging the Bookworm. I bought this a few years ago, but never got around to reviewing it, or indeed using it much at all which is a pity since it's a lovely title. The book alternates between full color watercolor spreads of the bird, butterfly, and eel and three parallel panels, comparing their migratory journeys. On the farm, butterfly (a monarch) lays her eggs in the meadow. Bird (a barn swallow) builds her nest in the barn and cares for her babies. Eel (American Eel) eats fish and insects and builds her strength. Eventually, they all migrate - the bird to South America, the butterfly to Mexico, and the eel to the Sargasso Sea. A final note gives more details and information on the three species, their migration, and the history of research into their behaviors. The text is simple and suited for reading aloud, the paintings colorful and easy to follow and enjoy. 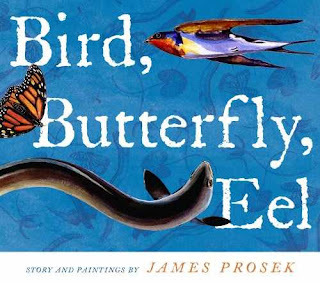 There are a few things I found odd - the text explains that the butterfly is a monarch but doesn't identify the bird or eel except in the final note. It was a little confusing that the three all migrate for different reasons and I would have liked to see that delineated a little more clearly in the text. Verdict: Beautifully illustrated and the text is suitable for reading aloud - the few minor quibbles don't overshadow the excellence of this title. Worth adding to your collection even if you missed it the first time around. This week at the library; or, Now that's over let's plan fall! Now I have until September 10 to plan the fall! (Sort of, I'm taking a week off when my mom and sister come up from Texas). Called the two elementary schools I want to attend open house at. Yes from one, left message for the principal at the other. Called my vendor about damaged books. Yay the awesomeness of BWI! Teen book club bookmarks, flyers, etc. Worked on website, updates, etc. Summer Reading Pies! I forgot them and had to drive all the way back home to get them. Just another fun part of this week's many enjoyable details. I'm always looking for more beginning chapter books, but this one was a disappointment. 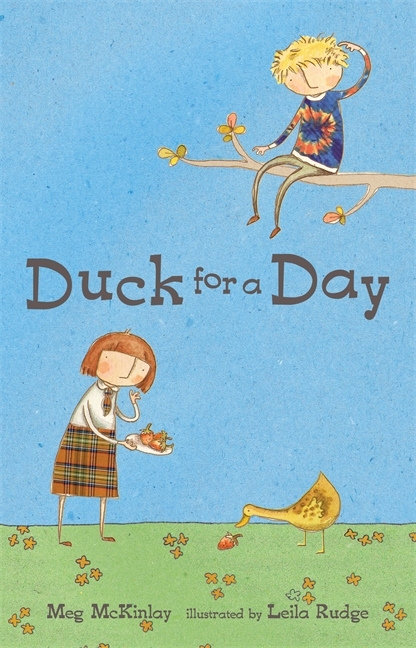 The basic plot sounded good; Abby's parents won't let her have any kind of pet, so she's super thrilled when her new teacher has a duck for a class pet and says the kids can take it home! However, the annoying boy next door, weird Noah, also wants to take Max home for the night. The illustrations are ok, I'm not a fan of the spaghetti-limbs style of illustration, but kids won't really care. What didn't work for me in this book was the over the top, eccentric adult characters. Abby (rules-oriented, a bit prissy) worked fine. Noah (untidy, a little kooky) was good. Abby's teacher, Mrs. Melvino, is one of those...eccentric teachers. That only exist in books. They always have "wild, curly hair" they write in colored pen (usually purple) and have kooky glasses. They dress in eccentric clothes. Newsflash, authors! Teachers do NOT behave or dress like this. No teachers that I've ever met, anyways, and I've met pretty much every teacher in our three elementary schools and lots of student teachers when I was at school. Student teachers might be a bit more casual, but I think you've gotten teachers mixed up with children's librarians. Some of us can be a bit kooky, yes. But I think a school principal would look askance at a teacher who lets a duck decide her class schedule. Now, this is an Australian import, so maybe education is a bit different over there, but I think it's unlikely. I also found Mrs. Melvino's increasing demands for Max the duck weird. It was like she was behaving like a child. I also was annoyed to see that the author picked up the tired old "parents who are so obsessively neat they can't stand an animal of any kind". 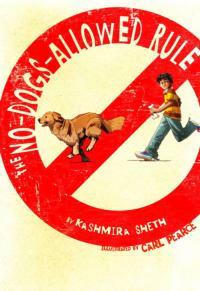 Verdict: While I didn't like the adult characters in this book, the plot is just different enough to grab kids' attention and the children are well-drawn characters. I think I'll put this one down as a maybe. ISBN: 9780763657840; Published 2012 by Candlewick; Borrowed from the library; Added to the library's wishlist. I am all kinds of excited to announce, if you haven't noticed, that I will be the organizer for Non-Fiction Picture Books this year! Apply for my panel! Whee! It's August so you know what time it is...time for new Toon Books! I'm not an uncritical admirer of Toon; I think some of their titles are a little too arty and a little too "look at me, I'm illustrated by a famous artist" for my small community, but when they hit it right, they hit it right. 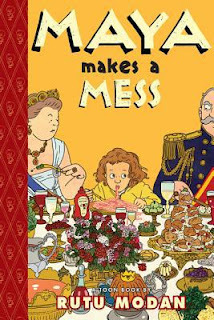 This year, they're offering a debut children's book from an experienced graphic novelist, Rutu Modan. She addresses a common childhood complaint; parents who think their children are messy eaters! Maya is certainly a messy eater, but nobody expects what happens next: An invitation to dine with the queen! Of course, food messiness ensues and all ends well, with Maya triumphant. Modan's art is intensely detailed. Every facial expression and fancy dish is sharply delineated. The characters and focal points of the scenes stand out in sharp color against the faded, almost dream-like backgrounds. Closer inspection shows sometimes detailed, sometimes vague interiors but the eye is immediately drawn to the forefront of the art by the color and lines. If you like messy eating and want to try for your own copy of Maya Makes a Mess, enter a picture for the Messy Eater Contest! Verdict: This is a level two comic and the language is suited to emergent readers, although the busy art may be a little distracting from the simple speech bubbles. While this isn't a particular favorite of mine, children who like the absurd will find this one hilarious. I was actually looking for something else by Molly Bang when I ran across this title, but I am so glad I requested it. It's more than just a beautifully illustrated nonfiction read-aloud. The illustrations and text are so skillfully intertwined, that the authors are able to integrate much more information than an easy nonfiction book would usually include without losing the attention of young children. 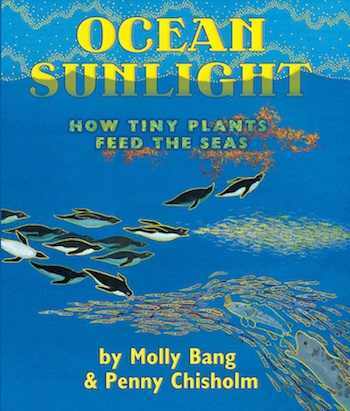 The book explains the process of photosynthesis as it works in the ocean so that even young children can understand it. Unlike the land, where energy is taken into plants then eaten by humans and animals, the ocean only has plants in very shallow areas. Instead, the ocean has phytoplankton. These tiny plants are eaten by tiny animals, zooplankton, which are then eaten by progressively larger creatures. Deep in the ocean where phytoplankton cannot reach, there is Marine snow, tiny bits of organisms that floats to the bottom of the ocean where it becomes food for bacteria and other creatures, generating a process similar to photosynthesis. Phytoplankton need the nutrients generated by this process and they get them as the ocean is stirred by currents. The book finishes with a detailed section giving further information about each step of the processes described in the book and including some further resources to explore. Molly Bang's stunning illustrations blaze with light and color. The text is blended into the illustrations and formatted to hold the reader's attention as it moves in and around the art. Blues, greens, and yellows flow through the book, showing the light from the sun, the green growth of plants, and the massive blues of the sea. Verdict: This is an awesome nonfiction read-aloud. If needed, it can be adapted a little to shorten it, but the glowing illustrations and carefully laid out text should hold the attention of a large number of children with a really good reader. I don't know how I missed this one, but I am remedying the error immediatey! Left around 11 to pick up marshmallows and a couple other things I needed for programs. Realized I forgot to write up the staff meeting minutes, but I got most of the teen summer reading slideshow finished. We have 27 teens participating this year, up from 19 last year, and their reading is varied! Confirms my suspicion that it's mostly adults reading/requesting Hunger Games read-alikes and bestsellers. Although I admit these 27 are probably not totally representative of the teen reader population. Was not supposed to be an endless day, but turned out to be one after all. then walked over to pick up a local book we couldn't buy elsewhere and Sara the Librarian and I went to dinner to vent and discuss PW's spring 2013 publishing notes. the Scholastic Book Fair arrived in the morning (I had expected it yesterday and one of my two volunteers was now showing a steer and couldn't come). Stayed until 7pm for the committee meeting for the Craft Fair in the fall. Looks like I'm doing publicity. Got home around 7:15. Fair opening volunteer did not appear and could not be contacted, so I worked the information desk AND the fair until 11:30, when my next volunteer came. Endless patron questions (remember through all this that we are BUSY. Started getting read for Lego Club. Realized I had scheduled a gap between my aides and had no one to set up Lego Club and no one to run the fair until my next volunteer came. Convinced one aide to stay late and snaffled a teen that was wandering through. Yay Kellee! She helped us move all the tables, set up all the chairs, and even stayed and sorted legos for a whole hour and a half. Yay Amanda! She showed up early to run the fair and stayed until 6. I closed out the fair and left around 6:15. I think. It might have been 6:30. Got an email at 7:40am "The IT guy is coming, who's going to be there at 8am to let him in?" Groan. Fortunately, I got hold of someone else who told me someone else had planned for someone else to let him in. 9:30 - morning volunteer did not show up. Ran fair & desk again until our adult svs librarian came in at 10, when she took over the desk and I took over the fair until my next set of volunteers came in at 11:30. Then I grabbed lunch and went on the desk from 12-3. All the local adult group homes picked yesterday and today to visit the library, btw. Busy. Helped aides set up room for tomorrow. Did misc. stuff. Yay! Super Amanda showed up to help out with the fair again. I went back on the desk so our adult svs. librarian could go get her kids - who have probably forgotten what she looks like by now. Another volunteer actually came! Thank you Debbie! She brought her kids, who were unbelievably well-behaved. We were all in awe. Lugged boxes, sorting through summer reading prize books. Closed out the book fair when we closed at 6pm and got home eventually. For those of you who are wondering why we seem to have so much trouble covering desk shifts, I will tell you that we have three desks - upstairs adult reference/teen, which we gave up even trying to cover several years ago, downstairs children's desk, covered by yours truly when possible, and entrance information desk, manned by everyone else. That everyone else would be the adult services librarian, director, cataloger, myself, and the reference assistant. Did I mention the reference assistant and cataloger are part-time? And asides from us, all the other staff are circulation clerks? Meaning we do all the programming, technology, publicity, collection development, etc. Also, the director, reference assistant, and cataloger were gone. This may be the last time I do a Scholastic Book Fair. Came in about 9:30 to finish setting things up. The community room was already set up for painting - the tables were all covered. I just had to put out the paint and fetch all the things I had forgotten. Aide and book fair volunteer came at 10. Book fair volunteer was not comfortable running the fair alone, so my aide joined her. Which was ok, because only about 30 people showed up. Our adult svs librarian supervised the fire, marshmallows, and sidewalk chalk and I kept an eye on the paint and the book fair. I would not have been surprised if 200 people had shown up, but I was very happy with 30. I think one more giant program would have given everyone concerned a heart attack. The weather was gorgeous, people dropped by the sale and did a little painting, roasted a few marshmallows, all very casual. The party ended around 11:30 and I did misc. stuff, spent some time talking to my 12-2 volunteer, who is one of the elementary school librarians and always helps us out. End of semester stats - 500 kids participated in summer reading and turned in around 1600 bookmarks. Or a little more, I haven't finished those stats. At 2pm, my four volunteers (kids who live nearby) helped me pack up the fair, move back the tables (this was very labor-intensive, as they're not intended to be moved and are heavy). We had lots of cookie breaks (I had a tub of homemade cookies) and at 3:15 we were done! They grabbed the rest of the cookies and left on their bikes, except the girl who lives a couple miles away and had walked so I drove her home. 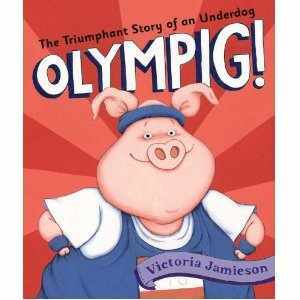 Boomer is determined to be the first pig to enter the Animal Olympics. He doesn't care about the discouraging remarks of his family, the nastiness of reporter Mr. Hamstring, or all the people who say he can't win. He's got his mom's support and he's practiced hard and will do his best. He's positive that it will all pay off. Wrong. He loses at everything and has a temper tantrum. But...then he has one last chance to wow the judges. He gives it his all and...comes out with the lowest score ever. But that doesn't stop him from planning his next Olympic adventure. Funny and a nice antidote to all the "do your best and you can't fail" pap that's out there. The pictures are amusing with small inset comic panels, comments from the various other animals, and various jokes hidden in the pictures. Verdict: I read this several times, trying to figure out why I wasn't more impressed. Then I realized that without the message, this is just another average funny animal picture book. Add it if you want more books about winning/losing, but otherwise it's an additional purchase. This charming poem is accompanied by a bloodily distorted lizard carcass, smeared across the road. "Eww" I thought. I took it over to show my friend, Sara the Librarian. As we read the poems, we found ourselves laughing despite the gruesome, gross, and just plain weird content. Because they're, well, funny. From "R.I.P. (Really Inattentive Piranha)" to "An Infirm Worm" these poems make the reader glance over her shoulder and then snicker. They're irreverent, ghoulish, and hilarious. Jeffrey Timmins' illustrations are the perfect fit. Misty in hues of gray, brown, and splattered blood red, he adds even more naughty detail. A cremation urn next to milk bottles, the truck that meanders through the book collecting corpses along the way, the misty tombstones on the hill, they all fit the poems perfectly. Now, will I actually put this on my library shelves? Well...I was thinking probably not. Middle schoolers would find it hilarious, but I have no section for nonfiction for that age group. While a few younger children might find it funny, especially fans of Adam Rex, the chances of someone picking it up and being horrified or really upset (I'm thinking of that illustration in the horse cartoon where the sheep is pooping into the river and the horse is drinking it) are pretty high. It's funny, but I have plenty of funny books. If I want something a little weird and pushing the envelope there's always Adam Rex, who isn't such a complete gross fest. However, after I showed it to most of the librarians and saw how much fun they had with it I thought..why not put it in the teen nonfiction section! So, Last Laughs in all it's gruesome glory will be present in our library. Verdict: If you have a larger population with more diverse tastes it would probably work in the 4-6 grade age range recommended by SLJ. I don't know that I would purchase it, but since I have a review copy I will put it out for the teens to snicker over. Simple, poetic language takes the reader through the seasons in a garden, from watering and weeding to final harvest. This book leans more towards the fictional than, say, Galbraith's Planting the Wild Garden, but it's still a great read-aloud title for garden storytimes. In addition to the general cycle - water, weed, wait, harvest, cook, preserve there are several pages showing how plants bud and produce fruit. The story also shows how different plants take varying amounts of time to be ready for harvest. The final page includes some additional facts about seeds and plants. The language is beautiful and makes a great read-aloud, but what I really love about this story are the vibrant illustrations. Thick, black lines and lush color show the life and vigor of the garden as it grows from seed to harvest. Normally, I'd look for photographic illustrations so children can identify the plants shown, but the art in this book is so beautiful I'll gladly waive that requirement. I'd pair this with a painting project, maybe even letting the kids experiment with making outlines in permanent marker and filling them in to simulate the art style. Verdict: A great read-aloud for storytime and the art and text are lovely. Highly recommended. 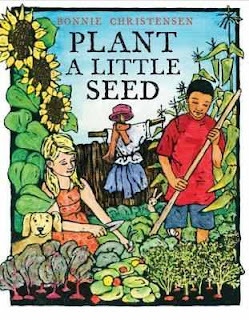 Pair this with Aston's A Seed is Sleepy or Galbraith's Planting the Wild Garden to show how seeds are planted and germinate. This week at the library; or, Only Two Weeks Left! But meanwhile, there is still this week to get through. Tuesday was our last big afternoon program. Our Friends paid to have Nature's Niche bring their Remnants of the Rainforest program again this year. Worth every penny, huge turnout, Dino is a great presenter and the kids and parents loved it. Some parents complained last year that it was "too long" and some staff suggested asking that we shorten it, but I just kept repeating, over and over, "Not all programs are suitable for toddlers and preschoolers. This programs is open to families and they are welcome to bring little ones, but it is aimed at elementary and older kids and adults." I really emphasized that this year, bringing in David Stokes for the little ones, telling people they might want to hang out in the children's area and just come back over at the end to see and touch after all the talking was over. We fit more people more easily in the room as well, since I did a better set-up than I had before. A note on my monthly report - I have started tracking the children's circulation and, after four years, it is now equal with the adult circulation! When I came it was a quarter of the adult circulation - and the adult stats have not stood still either, they have been growing constantly as well. All hail my awesome collection development and reader's advisory powers! Wednesday - Preschool Interactive, various stuff, mildly busy. Thursday - Tried out my quilt program at Messy Art Club. More on that later. Friday - Eh. Friday. Still working on fall stuff, I want to have the calendar at least ready by next week. Lucy is not having a good day. She's had a fight with mean girl Jacinta and nobody understands, least of all her teacher Ms. Denny. So she threw a tantrum and ended up in the time out chair yet again. Then she gets into even more trouble when they go to pick up her great-aunt from Holland. Lucy was looking forward to sharing her room with Tante Bep, but her aunt thinks she's bad and tells her scary stories of Black Piet, who comes to carry off naughty children in his sack. Things go from bad to worse as Lucy gets into more and more trouble until finally she decides she has to test herself to see if she's really bad or good. Of course, her test goes wrong, but everything turns out ok; her parents reassure her, Tante Bep admits she was wrong, and even Ms. Denny turns out to be much nicer than Lucy had thought. This is a little longer than the beginning chapter books I'm looking for, but Lucy's frustration and endless troubles are well-written and will draw readers in from one scenario to the next. While I never really bought Tante Bep - it's hard to believe Lucy's parents wouldn't tell her about their son's serious food allergies or that Lucy would believe the old Black Piet story - she makes a good catalyst character to set off Lucy's troubles and finally get everyone to resolve the problems. 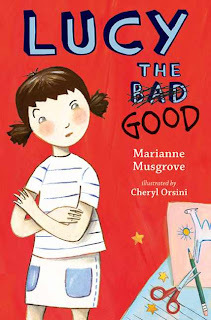 Musgrove does a very good job of showing the other adults as real people; one of the things Lucy realizes at the end is that there are other perspectives. She realizes that Ms. Denny sometimes get distracted and flustered, that her dad has trouble relating to Tante Bep, and that Tante Bep isn't quite as mean as she seems either. The book concludes with a recipe, translation of Dutch words and phrases, and an activity. Verdict: This isn't quite what I was looking for and I thought the Tante Bep character was a bit unrealistic (would she really be old enough to find Lucy's dad being a "home manager" strange? ), but it's a good intermediate chapter book and kids will enjoy reading about Lucy's endless problems and their satisfying resolution. An additional purchase.